Only 9% of marketers have all the marketing technology they need and fully utilize it. That remarkable statistic stood out to me from a new report on marketing technology strategy published by Ascend2 that reveals some interesting insights on the utilization and effectiveness of marketing technology today. Kudos to the 9% who seem to have their marketing tech situation fully baked! Of course, it’s possible that some percentage of those people may feel that way, but are actually delusional (“we’ve been fully utilizing our blast email program for 10 years, and that’s all we need!”). But to be optimistic, let’s say all 9% are rock stars in martech nirvana. I’m both surprised and not surprised by that number. Knowing the incredible rate of evolution in the marketing technology landscape — and, more importantly, rising customer expectations of digital experiences — it’s not surprising to me that relatively few marketers feel that they’ve fully optimized their marketing technology stack. For most, marketing technology capabilities are a work-in-progress — and realistically, are likely to remain that way for some time. But, stepping back for a moment, it is a remarkable commentary on the state of our industry that 91% of marketers don’t feel they have a complete, fully utilized technology stack. Is any other profession facing that dramatic of an upheavel of their toolbox today? Let’s set aside new technologies for a moment and just consider utilization. Combining the second and fourth columns in the above chart, 59% say they don’t fully utilize the marketing technology they have today. Or put another way, the features of marketing technologies have outpaced most marketing departments’ developing organizational capital to harness them effectively. 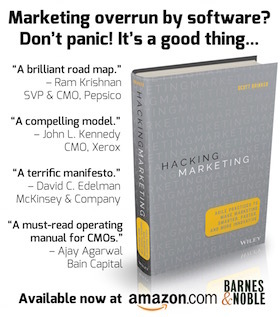 To me, that’s the big opportunity for the growing discipline of marketing technologists. Their overarching mission should be to help companies squeeze the juice out of the potential that these technologies have to offer. Selecting and integrating the right tools is just the tip of the iceberg. The real opportunities for marketing technologists are collaborating with the rest of the marketing team to creatively apply these tools in the service of brilliant marketing. 87% of the respondents said marketing technology is improving marketing performance at their companies. 32% said that is was improving it significantly. We all know that marketing technology has its challenges. But if it’s able to deliver results, it’s worth the climb. But 55% say it’s only improved marketing performance marginally. While I don’t have access to the correlation data from Ascend2’s study, I suspect that this cluster corresponds with many of the participants who believe that they’re not fully utilizing their marketing technology stack as well. If so, that’s an opportunity. Speaking of opportunities: for marketing technology vendors, it’s worth noting that 67% of marketers acknowledge that they don’t have all the tools they need yet — even after “tool exhaustion” has become a recognized psychological disorder in modern marketing. That’s identified need, the lowest hanging fruit. And in a space where the “horizon of the possible” is advancing pretty quickly, there’s clearly a lot more potential for martech sales growth. To support those identified needs, the Ascend2 study found that 64% report that the budget for marketing technology is increasing at their company. This is another point on the curve to support Gerry Murray’s growth estimates for over $25 billion in worldwide marketing software spending in 2016. Previous Post Would Hacking Marketing make for a great SXSW talk? Sounds about right – in my research on martech adoption I figured it at roughly 10-15%. In Geoffrey Moore’s language, martech has not yet crossed the chasm. Opportunities abound! Of the 55% that said marketing performance was “improving marginally”, 66% “don’t utilize [marketing technology] they have”. Ah, that’s great to know, Sergio — thanks for running that correlation! I get that this survey considers a full stack to be what’s perceived as needed, but what would be a full martech stack, in general terms? I’m new to the concept of “martech” as a field, though I realize I’ve been doing exactly that for years (I feel like I found my tribe!). I’m excited to start defining what I do in martech terms, and to see what, if anything, I’m missing out on. With marketing tech stacks, the definition I used is “marketing without Excel”. Tools centered on the person and branches out from there. I’ve always maintained that your marketing automation platform is the center of the stack and that system is an extension (extra bedroom you added onto your SFA system). Any marketing technology that would fall into the “stack” must connect, otherwise it’s a lost game of Jenga. So for arguments sake, Marketo would be the center. And all technology is centered around creating, measuring, managing the best experience for those people. Similar notion to identity management. The tools in the stack are there to make sure that only one “me” is recognized regardless of if I’m on social, your website, a syndication partner’s website, in the pipeline, getting an email, chatting with a rep, attending an event, asking for a call, downloading content or seeing your digital ads. One person – connected throughout the technology. If that’s happening you have a tech stack. My initial thoughts agree with your comment that a good number of the 9% that are claiming to fully use their martech stack are delusional. There is so much capability being added at such a fast pace, its hard to believe that nearly one in ten firms are actually done with all the implementation. And that doesn’t consider the change management efforts required to fully optimized use of all available technology. I’d go one step further to suggest most of the industry rock stars know that they haven’t fully optimized use of marketing technology, and continue to press for improved performance from the tools they have, as well as recognizing added functionality as it become available–either through platform evolution form existing systems or addition of new layers to the stack. Those same rock-stars know there is an ever-evolving change management requirement, evangelizing new technologies with sales, inside sales, account management, customer service, etc. With such aggressive innovation in the industry I don’t think there can be a complete or end-state reality for technology-centric marketers today. We’re going to be an evolving journey of new capability, new providers, and new functionality for the foreseeable future. I was inspired by this post and the data to put down my thoughts on the Marketing Technology Maturity Model that’s been in my head. At one point, I agree with what Steve said – the 9% are likely vendors, but maybe some of them are delusional. In such a small sample size, 9% are 20 respondents from X companies. I would also be suspicious of firms that claim they have achieved the nirvana state because of the continual innovation and changes to marketing. But there never was a real end state in business either, so if you are saying you’ve reached nirvana, you probably haven’t. I appreciated your comments and regular blog posts. As a long time successful marketer, and one who has always been ahead of most practices yet timely to customers needs, this feels like a major Lemmings march to the reverse of what we old timer creatives heard when one only focused on engagement – art for art’s sake. The reverse – Technology for technologies sake, seems even worse. Cool does not beat out wisdom but put the two together and you have a force. Understanding MarTech speak does not make one effective. It may justify their jobs to the left brain majority but brand value, growth, credibility, opportunity response time and more…am just not hearing it. I saw Gartner’s prediction that by 2017 89% of all companies would make digital their top customer experience management investment. Plus they say most will fail. I have to agree because technology is not strategy. Technology can contribute to and implement to strategy but does not take its place. Some tech marketing professionals are worse than the engineers I worked with respectfully in HP when I led the most strategic programs they ever saw. We are supposedly entering a conceptual age. Business creativity was selected as the top required skill CEO’s and their teams need to ADAPT. People-powered networks are reshaping how corporate America has to behave, not technology alone. People value efficiency apps but that is not effectiveness.They value human interaction yet investments in customer experience automation are way up. “Technology-centric marketers” exactly explains the problem here. We have expanded customer centric to human-centric as both employees and customers matter and integrated delivery and feedback which again technology can help but the service I’d love to see is a God honest evaluation tool as most technology solutions overstate their value. Now keep in mind, these surveys may be looking at the tail of an elephant and calling it a snake. Far too many companies are doing exactly what their competitors are doing. No imagination and ideas are ordinary at best. They see a problem, not the system behind it or the components. The role of a CMO has to change and yet the few that try end up being order takers not market shaper’s or company value architects. Or they try to make marketing like engineering so they can be respected. That’s all B.S. but one has to listen and challenge themselves constantly, be human first and earn human attributes – trust, believability, empathy. read Dan Pink – why right brainer’s will rule the future and Brian Solis What’s the future of marketing as they are asking the right questions. I’ll close with some self criticism. My tech stack would not measure up to the criteria of this report and my web site is 5 years outdated so doing a new one soon to speak to a major urgency upon us. But I can say with great certainty that our ability to do strategic foresight, ecosystem planning, read markets and show greater empathy for customer shifts will far outpace any technology driven approach. I have had $2B in ROI 6 times and never less than $100M for a new product launch inside a years time. With a low cost of entry, greater competition and a more demanding customer, marketing professionals better be packing more than a litany of tech tools.